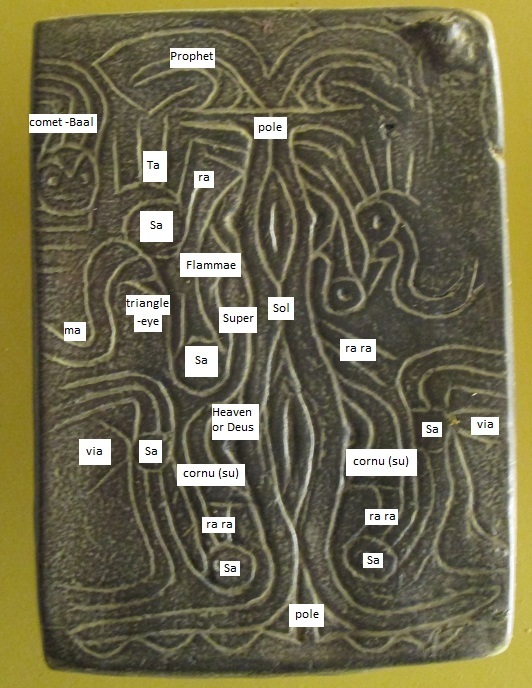 The Lakin A Tablet is just as abstract as the Gaitskill Clay but because we have deciphered that tablet this is easily read. It is a more fluid and evil looking version. Indeed, the message it relates is of a monster that came to Earth and he is shown in the upper left with an angry scowl. His mirror image has been worn away in the upper right. The central pole has an ominous look and the two feathers of the Prophet symbol #524 are dominant at the top. Thus we have a pole that ‘could tell all.’ At the bottom a small pole protrudes from mountain peaks. There are three peaks on each side for 33. Similarly, counting the 2 feathers at the top first and then the 3 mountains, and then repeating the count in reverse we obtain 23 32 for the latitude of the Arctic Circle which surrounds the pole. The power in the pole is contrasted by the orderly-disorder of the two mirrored panels. The multiple circles once again suggest a multitude of comet craters. The total count of circled dots is 8. The pole contains 6 slits. Combining these two numbers gives us 86 or a reminder of the diameter of the Sun at 864000 miles. Each side contains 4 circle-dots. Each group of slits contains 3. Combine these and obtain 43 which is another way they noted 86. Reverse the 43 and obtain 34. Recall 34 is twice 17 and that 90 – 34 is 56. The meaning of this important number we have yet to discuss but it has appeared on previously studied tablets. The 4 dots on each side creates 44. The two groups of 3 creates 33. All of these numbers we have seen before on other tablets. Each group of slits can be counted as 1,1,1 or 1,2. This repeats lower giving us 111 and 1212. The 111 squared gives 12321 or a sense of order. If the two sounds ra and pa are reversed, instead of obtaining rope we create ‘pair.’ In fact all navigation still to this day is based on a ‘pair’ of poles. The first pole is true north. The second pole is magnetic north. The suggested reading of these tablets is that they relate that the pole moved. Perhaps they had first hand knowledge of a shift of magnetic north away from true north and that the cause was a comet. 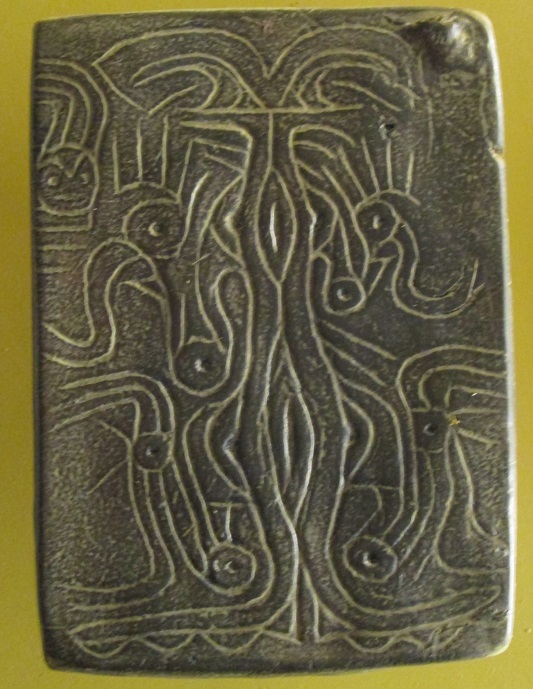 The hands of the Gaitskill Clay Tablet are here seen as eyes with eyebrows. They are the upper most circle-dot with 5 fingers. It might be fairer to say four of the lines are on the eyebrow and one projects straight off the circle-dot for a total of 5. Projecting from the lower side are 2 lines. This gives us 52 and 7. As in the Gaitskill Clay we note these represent days in a week and weeks in a year. If the brow is divided up into 1 and 4, we obtain both 14 and 241 which were found in the same position on the Gaitskill Clay and suggest numbers 56 and 58,000. The latter recalls Earth’s yearly orbit through the heavens of 584 million miles. The circle-dot in the Luwian Glyphs represents the sound ‘sa’. The brow shape with the upward strokes is found in Glyph #172 and has sound ‘ta.’ ‘Ta-sa’ does not sound all that familiar yet it suggests the word ‘tease.’ In Anglo it was ‘teosu’ meaning harm. If the line off the circle which is not on the brow is interpreted, then we have ‘ra’. Pronouncing ta-sa-ra we have both the old and modern word tessera which is a tile (such as ceramic) or a grid square as found on a map, or as found in the object under examination! The upper circle-dot is connected to the next one and that provides the sound ‘sa’ again. What is tessera-sa? Tessarace. A tessarace is the summit of a four sided pyramid. The summit of the Earth once divided into mapped tiles is the North Pole. On the left side of the lines joining the upper circles is a triangle. This appeared at the top of the Gaitskill Clay and is interpreted as a sword, or eye of Baal. The loop off the second circle that curls towards the pole is the symbol Super #70 which means above. Enclosed within the lines is Flammae (flame) symbol #477. The two curled tails off the eye-brow shape form the glyph #110 for ‘ma’. In Anglo ‘ma’ means ‘more.’ The half circles on the sides of the center pole also create the glyph #182 Caelum which means Heaven or #360 Deus which means god. These ideas complete the picture of a dangerous flaming comet above. The bottom left circle-dot gives 23 32 in the same manner as the Clay Tablet. It also shows 222. The lowest circle shows 4 lines as does the one above it. Recall a square of sides of 4 has a diagonal of 5.65. Both of the mirrored lowest circles are positioned at the base of the pole as if to strike there. Pausing to examine this lower set for expressed words we find ‘ra-ra’ and ‘sa-sa.’ Ra-ra suggests the words rear (raer) or roar (rar) in Anglo. While ‘sa-sa’ repeats the idea of ‘sess’ or seat. The two V lines also represent the glyph Via #221 and means ‘path to.’ Above the lowest circle-dot is an enclosed shape that represents glyph Cornu #108 which has sound ‘su’ and means horn. In Anglo ‘su’ means sow, to plant. This is all consistent with reading the circle-dots as a progressive story. Reading the four circles from top to bottom then we have a large ‘harm,’ a comet, with two long flowing tails above flying through the ‘tiles’ of ‘heaven.’ It has ‘more’ wings or troops traveling with it. It is a flaming danger from above. It draws near where it is clearly seen to have two tails. It ‘roars’ toward the ‘seat.’ Where they ‘sow’ themselves. They strike at the ‘ray rope,’ the pole in the mountains. This is an extremely complicated story which we are able to translate because of the years of labor done to decipher the 14th to 13th century BC Hittite documents of the Anatolian regions of Turkey. The Lakin A Tablet and the other Adena Tablets tell an extraordinary story of our history in the not too distant past during the age when ice laid over Canada and Ohio. It is from a time when Ohio first became inhabitable and adventurers came to see for themselves and exclaim in angst that it was true. Their eyewitness accounts pass through the ages to us. We have ears to listen but can we hear? That Europeans were coming and going from this continent (and vice versa) is evident by the shared language, symbolism and measuring system. That we cannot comprehend how they could have measured longitude, latitude, and planets so accurately is not their error in understanding but ours. They cannot be made to be just ‘cavemen in the stone age’ just because we are grossly ignorant. After all, they are relating that the Earth was struck by an enormous comet. If a large comet struck us today, Walmart would be empty forever in a few hours. We too would be fashioning hammers from stones and making every effort to remember the diameter of the Sun and the Earth and telling wild myths to future generations of men who walked on the moon. Yet to be reviewed are the stunning Wilmington and Cincinnati Tablets, the mysterious Bainbridge, and McKenzie Mound Tablets, the Ramey Peet Tablet from Cahokia Mound, the way too accurate Gridley Stone, the beautiful Ohio Adena Pipe now a Ohio State symbol, and the Hopewell Shaman – Bear. Many interesting posts are to come. Hudson Bay as a comet crater of recent origin. This entry was posted in American History, Ancient History, Mysteries, Native American, Religion, Uncategorized and tagged Adena Indians, American Indian, Comet Impact, Hittite Hieroglyphic, Lakin A Tablet, Luwian Hieroglyphs, Mound Builders Religion. Reblogged this on Tinfoil Hat Lady.